Merlin, King Arthur's adviser, prophet and magician stands firm in his wisdom and as a master teacher is confident in his medicine. Although many a thief dared to try, neither man, nor magician could match his power. On his back he carries a baby dragon curled up in his carrying pack, this medicine activates the kudalini from his feminine side. Merlin’s staff born of spirit and crystal is ancient power from Atlantis. This power is held on his masculine side bearing the symbols that activate the energy emanating through Merlin’s magic glove, the trident, the Druid triple moon with all seeing vision, the vesica pieces and other medicine power. The white rose is a symbol for the Divine Mother and his fluffy little animal friend is feminine too, all showing a perfect masculine feminine balance within this Master Teacher. 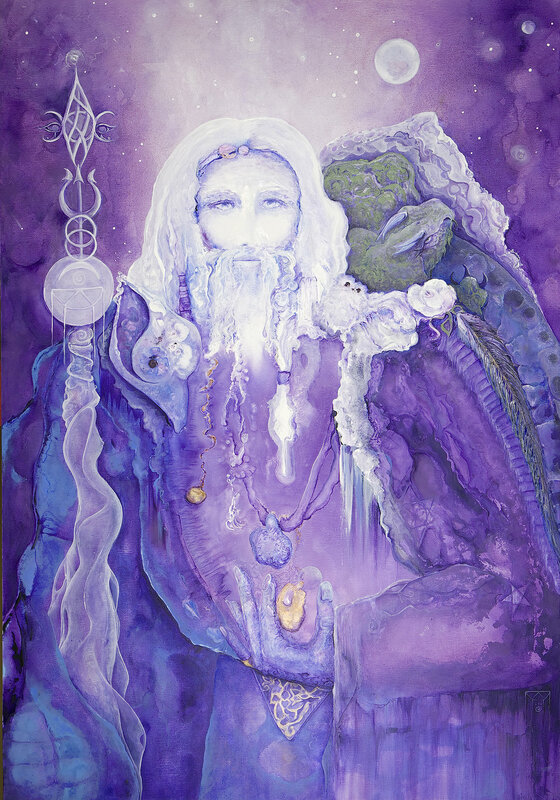 He wears the violet robe of initiation, which is a symbol and preparation for a transformation of things yet to come. He offers a complete re-evaluation of awakening to your true self, as he is a Master Being of many incarnations. “Make thy quest for the Light thy most fueled flame. One day thou wilst awaken to the wisdom that ye already have arrived. In the Light thou shall hear a tone, tis there thou wilst find a passage. The Story/process and initiation of painting the MERLIN. In the fall of 2005, I traveled to Glastonbury, England, the Isle of Avalon. To gaze in awe upon Stonehenge, to kiss the ancient stones at Avebury, the Tor, and pray in Druid caves and chant in ancient groves, to live in a castle. I was in Heaven! Like a memory re-awakened. Merlin came in with a prominent and strong face, closed eyes, nose, mustache and dreadlocks behind his veil. Powers of alchemy exude his being, like the mystic lore of the ancient forests. He is the first Being I have brought through on canvas that commanded me to be his equal. He very strongly urged me be in my power and at the time I was unaware I had just stepped into a powerful initiation. It only took a few days from the time I began his portrait to perceive my world falling apart, which soon urged me to take a road trip to Cornwall. 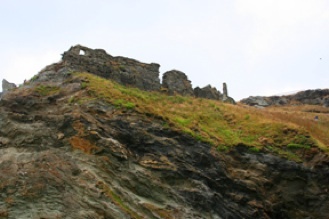 A road trip to the most southern part of England and visit Merlin’s Cave near the place of King Author’s conception at Tintagel Castle. Welling into a deep transformational initiation as a result of painting the Merlin, I felt there was energy to explore, experience and retrieve from this place. I felt his message strong and with a sense of urgency. The air was crisp and there was a strong ocean breeze. Silently drawn towards the edge of a cliff, I stood in awe as I watched waves crash and role in the bay below. A vast opening in the mountain with massive energy, flooded my sight, this was Merlin’s Cave. High above I could see scattered ruins of Tintagel castle, but before I traversed up the steep steps to explore the ruins, I had to go into that cave. With the medicine that I had brought with me offerings and some special crystals, I made the steep climb down. When I reached the sandy beach, I stopped to catch the moment and breathe it in. I wondered what was transpiring on the unseen levels here where tourists walked around seemingly oblivious to this power and mystery. Although grateful, I found myself somewhat distracted and wished for a private place to meditate. Grateful for a message and a private area to meditate here within the busy crowd in Merlin’s Cave; I exited my secret corridor and found my friend meditating in her own space. As I approached, I noticed her staring at a large rock in front of her; she asked me in her Welsh accent if I could see a White Buffalo in the rock. I could! I shared with her in amazement that I was just thinking about the White Buffalo. I thought gratefully how the spirit of the white buffalo is here with simple intention, even without the fur and I got my camera out and took a digital photo of the buffalo in the rock. Upon returning to Glastonbury five days later, I incubated to my room in the ashram, I’d begun to run a fever. For thirteen days, I hallucinated in dreams and suffered much body pain that reminded me of a Native American vision quest I had done a few years prior. Only one other time in my life had I been so sick, I felt I was probably integrating some heavy powerful energy and clearing some deep core emotional body stuff and I did my best to surrender. 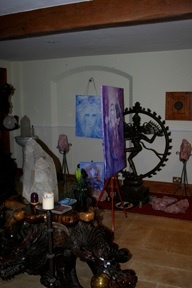 Merlin’s presence as well as the painting was with me, when I was awake I meditated with him. Merlin spoke to me of suffering he had experienced too, love loss, feelings of instability, abandonment, and loneliness. He had suffered much and it was not until then, that he could become a master shaman and shape-shifter. He has the ability to go far beyond the physical form and be in many places simultaneously. I knew he was sharing these things with me because of my own suffering, reminding me it is all for a reason. I was grateful for the Master teacher showing compassion, I felt comforted in a difficult moment. I carry my paints with me wherever I go therefore right there in the ashram, in between sleeping to repair and allow integration for my body and spirit; I brought the Merlin’s face through. In opening his eyes and offering love energy to him, I hoped my journey too from now on would be made easier with open eyes. 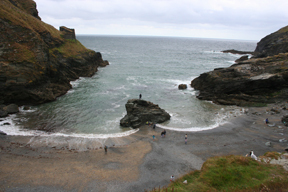 As I began to feel a little stronger, I opened up the photos I had taken in Cornwall and glanced at the thumbnail shots. Leaping out at me appeared to be a photo of a white buffalo. I opened it up to the astonishing realization that I was looking at the photo I had taken of the rock with the white buffalo in Merlin’s Cave, yet what I was seeing was phenomenal. In the moment I took the photo, the way the people walked into the opening of the cave created the shadows in the light to form a huge visual of the White Buffalo. The hectic crowd of tourists that had distracted me before now became a participant of what feels like a great blessing and connection to Spirit, Merlin and the White Buffalo. In my mission to complete The Merlin at that time I had no clue so much more of story would evolve. After the ashram, I moved into a castle/manner in Somerset, near Glastonbury on the exact center of the Zodiac. I knew I was to bring through his medicine. I had to trust and follow the lines that I found in his hands, strange and magical symbols that looked as though they were emanating through his skin. Merlin had a very cosmic feeling in connection. When I completed his hand, a strange thing occurred, as I meditated with him I began to see a thief on Merlin’s back charging him in full force. I saw the huge hand I just painted as the thief’s hand trying to steal Merlin’s medicine. While using the didgeridoo and sending love into the energy, which is what I do for the healing aspect in my painting, I covered the thief’s face with white paint and prayers and returned later after the paint had dried. To my disbelief not only was the thief still there; his face showed even more to include fine detail of his eye. After a few good strong moments of fear, I remembered my mantra, “everything is always in perfection even when it doesn’t look like it.” I sat again in meditation with him to discover more. I felt that Merlin could have had many thieves try to steal his medicine power. But, he showed me that he stands unaffected and feels no fear. And he encouraged me to go in that I was very capable of painting this transformation. As I contemplated on the thief’s transformation again in meditation, I began to see a perfectly formed baby dragon curled up in his carrying pack. My excitement rose as the baby dragon came in bringing added medicine and activating the kudalini from his feminine side. Painting Merlin has been truly an honour and great lessons of humility. He shares these things to remind us all suffering when transformed using Alchemy is a true and powerful gift. The important thing is the quality of passage, reminding us it is all for a reason as a true master teacher shows compassion. Merlin is a Master teacher. 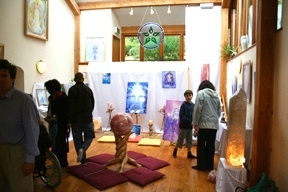 In his many incarnations some say he was/is also Saint Germain. “Alchemy is accomplished by changing the frequency of thought, altering the harmonics of matter and applying the elements of Love to create the desired result." If you have chosen this card open to the gifts of Alchemy and trust the process of change. All is in motion and is the alchemical process where you become infused with divine light and wisdom. Take your inner ear balancing medicine and a deep breath cause your in for a ride. Your attitude of surrendering to this Alchemical magic will assure your journeys extraordinaire. The drawing of the medicine card Alchemy is an opportunity to accept the promise of hope, unity and abundance. Merlin brings many ideas and dreams that have been hidden for years, now revealed. Open your heart to make room for your dreams and know Merlin will send the appropriate experiences and opportunities your way.